This review seeks to examine Provailen, one of the many products that are designed to help in offering relief from the symptoms of arthritis and joint pain. The manufacturer claims it is an effective relief that slows down the progression of arthritis, and it also works well without interacting with other drugs. They also allege that Provailen is free from all side effects because it is formulated with natural ingredients. Additionally, it helps to restore the body’s natural ability to function and move flexibly. The manufacturer also credits it with the capacity to reduce inflammation and enable you to enjoy better sleep. Lastly, it is also credited with the power to help users regain a more active lifestyle. This review aims to furnish you with all the necessary facts you need so you can make an informed buying decision worth your money. Reishi helps to deal with various immune system disorders, act as an anti-inflammatory agent, and also facilitates antioxidation. Tongkat Ali helps to promote muscle growth and repair. It also increases bone density, which is vital in combating arthritis. The inclusion of Capsaicin extract helps to increase the absorption of ingredients and blood flow in the body. The recommended dosage of Provailen is two pills per day unless a doctor advises otherwise. Customers can purchase Provailen at the cost of $21 for a bottle of 60 pills. This price is from Amazon, one of the online retailers of the supplement. The manufacturer’s website does not have mention the pricing of this product. In order to purchase from the manufacturer’s website, first, you have to fill in a form with all your personal information. Provailen does not have adverse side effects that accompany its usage. The manufacturer’s website even as a comparison chart showing what side effects other ingredients popular in other joint products may bring about, claiming that this product does not result in any of those side effects. The manufacturer’s website says it comes with a satisfaction guarantee and you are guaranteed to be pain-free within 30 days. However, they only seem to have a conditional return policy that claims to refund only one unopened bottle per customer for purchases made within 30 days. This provision isn’t helpful for a buyer who purchased several bottles. Moreover, there is no way a customer can try the product unless they first open and use it. The manufacturer’s website has no verified user reviews. However, we saw 32 customer reviews on Amazon that gave it an average user rating of 3.5 stars out of a possible 5. 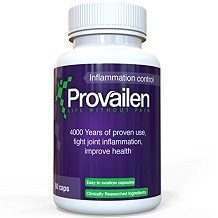 Provailen seems to be a decent joint supplement seeking to help people find relief from arthritis and joint pain. The product comes at an affordable price on Amazon, and it also has some positive reviews. However, it has a few missing links that give a potential buyer reasons to look for better substitutes. First, it has no GMP Certification that can testify to its overall safety and quality. Second, it has no clear money-back guarantee that can shield a customer from potential financial loss. The way the purchasing and return policy is set up on the manufacturer’s website, it seems to be very easy to lose your money if you are not happy with the product.